Microscope World Blog: What exactly are Stereo Zoom Microscopes? Stereo zoom microscopes provide lower magnification and reflected light with two eyepieces for viewing a "stereo" image. The eyepiece magnification combined with the objective lens magnification provides the total overall magnification, and creates a visual effect of depth of perception for the viewer. This three-dimensional capability produces laterally precise, highly detailed images, offers a larger field of view, and allows for extended working distances making stereo zoom microscopes ideal for viewing larger objects in lab, industrial and educational settings. These microscopes are often used in jewelry and watchmaking, circuit board inspection, dissection, microsurgery, and forensic engineering because they are ideal for observing large specimens and analyzing materials with complex surfaces. 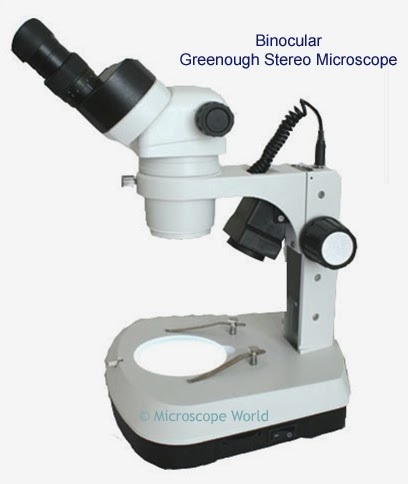 Greenough design: the most commonly used stereo microscope. Each eye has a separate optical path and the angle of divergence creates a shallow "V" design, which results in a three dimensional image. The greenough design is typically less expensive, and is best for examining and inspecting specimens at lower magnification of anywhere from 5x-90x. Common Main Objective design: for higher magnifications, the common main objective stereo microscope provides a better image. These microscopes are more popular for research and development because of the higher resolution images that they produce. The common main objective stereo microscope has a parallel optical path and at magnifications above 90x images are much more crisp and clean. 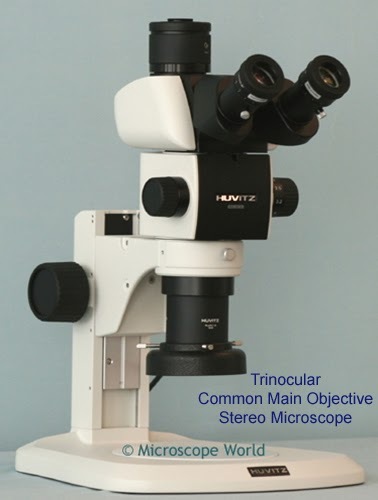 Stereo microscopes are available with either a binocular (two eyepieces) or trinocular (two eyepieces plus a camera port) head. The trinocular port typically has a beam splitter on the head of the microscope which when engaged, will allow light to be directed up to the camera and away from the eyepieces, resulting in higher quality captured images. Microscope cameras are great tools for classroom study, research documentation or creating reports. If you have questions about stereo zoom microscopes, or would like to speak with a specialist, please contact us today.